Barbara is a spunky taskmaster but, working with her staff, it is that very drive that has enabled TOPP to discover many of the secrets involving the migration patterns of these large and critically important animals. It was TOPP that coined the phrase "White Shark Cafe" to describe where great white sharks from California and Mexico migrate to in the Pacific Ocean. One particularly important finding regarding these migration patterns was the possible explanation for the seasonal nature of the sharks' sojourns: Mid-Pacific upwellings which bring nutrients that feed the food chain and ultimately replenish the larger fish that the sharks feed on. Cyclical weather and ocean movement patterns produce these upwellings - and as climate change continues to present itself, there is always the possibility of shifts in the upwelling cycle that could have unknown consequences for these animals. Whenever I am called upon to speak about sharks, these fascinating migration patterns are always a topic I include as I am guaranteed they will mesmerize my audience. So, thank you, Dr. Block! While Internet users can monitor the ongoing activities of TOPP through its website, it's now possible to carry it with you on your iPhone or iPad. 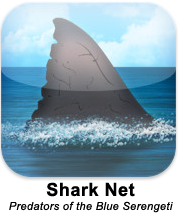 Shark Net - Predators of the Blue Serengeti is available from iTunes at no charge (as in free!) and provides a range of features on the cataloging and whereabouts of those most iconic of California ocean predators, the great white shark. Users can get updates on the latest monitoring of sharks, pinpoint the location of the tracking buoys that gather the data, and get biographies, photos, and videos about many of the sharks that frequent California's waters. There are other apps available that provide white shark tracking info but this is the definitive app for monitoring the white sharks that ply the waters off California's coast - and beyond, thanks to those incredible migration patterns. In a recent interview for U.K.'s The Guardian, Dr. Block explained her use of the term "Blue Serengeti" to describe California's coastal waters and the large migration patterns that occur within it. "White sharks and tuna travel for thousands of miles before returning to the same hot spot just as salmon do when they return to the same stream. These journeys are the marine equivalent of wildebeest migrations that take place on the Serengeti plain in Africa. That is why I call this part of the Californian coast the Blue Serengeti." "Everyone knows about watering holes on the Serengeti even though most of us have never been there. We can just close our eyes and see the zebras, the elephants and the hyenas. We want to do the same for the migration hot spots we have found off the coast of California." Dr. Block and TOPP are setting new standards for ocean animal tracking, expanding on the various GPS and satellite tracking methods (which can sometimes provide data intermittently) to include cutting-edge, round-the-clock monitoring technology using monitoring networks or even self-contained, solar-powered tracking stations like Wave Glider that travels the currents along the California coast. Through the efforts of TOPP and consumer apps like Shark Net, Dr. Block hopes to bring the hidden complexity of our ocean planet to a wider audience. Humankind's curiosity makes it look outward, and that has lead us into the stars. But there is a whole world to be discovered starting right at the shoreline. "Human technology has made it to Mars. We are transmitting gorgeous pictures from it. Yet we have not explored our own planet. Two-thirds of it is covered with oceans that are still mysterious places. We are trying to hook people up to what is going on out there now and get them to realize that it could all be lost if we did not do something to protect it. Ultimately, I want to create a world heritage site here. Wiring up the oceans, as we are doing, is our way to get people to understand the importance of these places."